I don’t have many memories from when I was very little, when we lived in a very small town in rural Saskatchewan. We left that town when I was six, headed to the “big city” of Saskatoon where I grew up. We left that little town far behind us in many ways, but for me perhaps especially in my memories as I was so young when we left. One of the few memories I have, though, involves an outdoor skating rink. My memories are more about the sounds than the sights of that rink. I can hear, even now and decades later, the scraping noise of skate blades on ice, the sound of the laughter of my sisters, my father’s voice as he set me down on the ice in my new skates, as trembly and unsteady as a newborn colt. I remember holding his hands, covered in black leather gloves, and I remember after the skate was over him flooding the ice, the sound of water spraying over the ice to make it fresh for the next day or the next skater to come along. It was the very essence of rural Canadiana; the kind of memory that stays with you for years and that seeps into you every time you see an outdoor rink or hear the sounds of laughter ringing off the rinkboards. It was the memory that came to me this weekend when hockey came to my hometown. I am a long way away from those days now. My father has been gone for many years – almost a decade, I am often stunned to realize – and it has been far longer than that since he put me on the ice of an outdoor rink. I call another city home, one a bit further north and both a bit larger than the small town where I once lived and a bit smaller than the city where I grew up. But this weekend, when Hometown Hockey made a stop in Fort McMurray, I was taken back a very long way, into memories of an outdoor rink and Saturday nights spent with my dad in front of an enormous box of a television where we would watch hockey. He may have always driven green Deere tractors and blue Ford cars, but this farmer father of mine bled blue and white when it came to hockey, an ardent fan of the Maple Leafs for his entire life and a preference he passed on to his youngest daughter. I would not call myself a huge hockey fan, although of any sport it is perhaps the one about which I know the most. For me though it is not about the sport itself but the passion of the people involved, like the little players no older than I was the first time my father put me on the ice on an outdoor rink in a tiny little town in rural Saskatchewan. 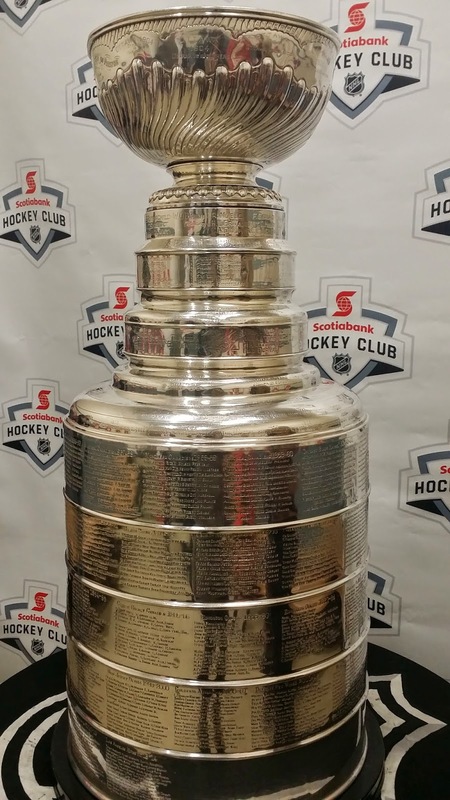 It is why I found myself smiling last week when I discovered myself face to face with the Stanley Cup, the Holy Grail of hockey. How fitting it seemed to me that I encountered it in a tiny dressing room just off the Terry Conroy Mini-Ice at the Suncor Community Leisure Centre, as my journey of the last few years took me down a path where I learned a great deal about Terry and how he was one of the founders of ice sports in our community, including the backyard rink he created every year where local children could play out their own hockey dreams. As I stood and gazed at the silver cup, etched not only with names but with decades and decades of history, I could not help but think how it was truly part of Terry’s legacy to find this cup so close to the ice surface that now carries his name, and how he might have felt to know that a group of very young hockey players were about to see that cup just before stepping out onto the ice that honours his memory. It is why when I wandered around the Hometown Hockey site – dotted with dozens of activities and events of every kind – I found myself grinning widely, listening as the sounds of children’s laughter echoed through the parking lot of the recreation centre where I am now so very fortunate to work. I went from tent to tent, observing quietly as the residents of my community – my hometown – celebrated hockey, our favourite national sport. I watched as Canadian icon Ron MacLean inspired young hockey players with his banter about the sport, and I grinned even wider when a friend texted to tell me that even though he and his son had been down the day before they were coming back as his son had so loved Hometown Hockey that he had asked to come back. I didn’t meet Ron MacLean or Lanny McDonald. I didn’t take a selfie with the Stanley Cup, and I didn’t lace up my skates. I was too lost in reverie for those things, my mind racing with memories long forgotten and tucked away, of a cold winter night when I could see my breath on the air and my skates touched ice for the very first time while I held my father’s hands. I found myself back on an outdoor rink in a tiny town called Reward, the crisp sound of skates scraping on the ice ringing in my mind. Hometown Hockey came to my hometown, but it took me back to another hometown from a long time ago and very far away, a place and time I hadn’t thought of for a very, very long time. I may not be a hockey player, and perhaps not even a huge hockey fan – but I think like every other Canadian there is a ribbon that runs through my heart that is tied to a memory of ice and winter and skates, and, yes, hockey, a sport that I may have never played but that has clearly touched my life and reminds me of days – and people – long gone. This morning I stopped to put gas in my car, the most mundane of tasks and one I do not relish in the early morning when the temperatures are cold. A truck drove in across from me, and from it emerged a man wearing a toque proudly emblazoned with the Hometown Hockey logo. I finished pumping my gas, stepped back into my car and held my frozen fingers in front of the heater to warm them – and I smiled, lost in memories once more of a time with my father long gone but as fresh in my mind as if it happened yesterday, and then I drove away, headed for another day in my hometown.